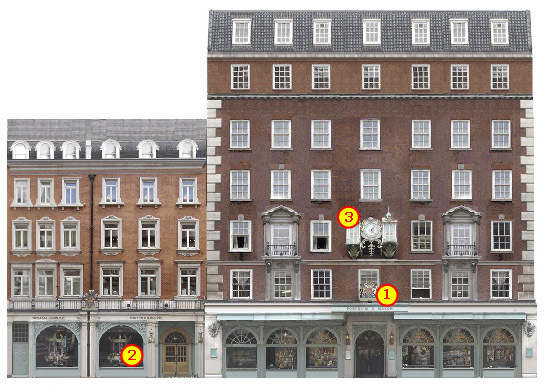 > Fortnum and Mason has stood on this site on Piccadilly for nearly 300 years. > The store has held a number of Royal warrants (1) dating back over nearly 150 years: Grocers to HRH the Prince of Wales and Purveyors of Oilery to HM the Queen amongst others. > Fortnum's intricate and carefully crafted window displays (2) are some of the best in London. > The clock (3) on the front of the building chimes every 15 minutes, and on the hour, figures of Mr Fortnum and Mr Mason make their appearance. There are 18 bells in the clock which were cast at the same foundry as Westminster's Big Ben. > Fortnum and Mason were pioneering importers of new and exotic foodstuffs from all corners of the British Empire, such as hart's horn (baking ammonia from antlers) and saffron. > The store had an 'Expeditions' department supplying provisions to the explorers and adventurers of the day. Champagne and tins of quail in foie gras were shipped out to the men making the first attempts to climb Mount Everest. > The Fortnum and Mason hampers have been a tradition since Victorian times when they were sold as picnics for visitors to the Great Exhibition in Hyde Park. Only a few 'Imperial' hampers have been made - the 'top-of-the-range' hamper costing thousands of pounds.